Sometimes you read a book because it captivates you from beginning to end. Sometimes you read a book because the premise grips you from beginning to and. And sometimes you read a book simply because it is calming, there are no hunger games, no holocaust, no horror-filled moments; it's just simple and uncomplicated and stress-free. This is why I read Love, Lies & Lemon Pies. Love, Lies & Lemon Pies is one of those books that you can snuggle down under the covers with before bed and immerse yourself into the sweet, and sometmes sour, story [psst. it ends sweetly, it's all good]. The problem? I got really hungry reading this book and it was 10pm at night. Sigh. SUMMARY: Connor: Far from home and exiled to a new school, all Connor wants is to keep a low profile and get through the year. But agreeing to help his step-dad out with the school play means he’s soon caught up in Grace’s schemes. Grace had a plan for this year – and it didn’t involve learning to sew. But being out of the spotlight isn’t the disaster she imagined, even if Connor is convinced she’s still a diva extraordinaire. Can Grace prove she’s really changed and save the play from the sidelines, even though her family is coming apart at the seams? Admittedly, I did enjoy Katy Cannon's debut more than this second installment, maybe because I enjoyed Mac and Lottie's characters more than Connor and Grace's. 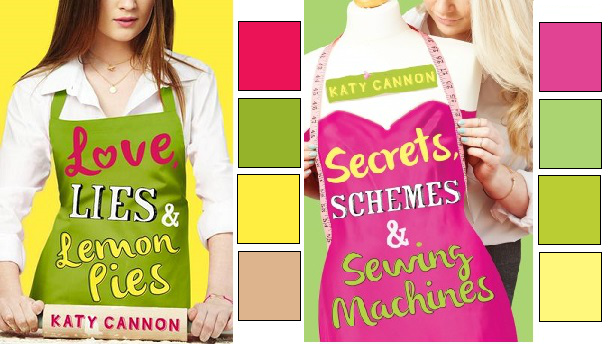 However Secrets, Schemes & Sewing Machines is definitely not a tangled web of threads, I did enjoy it a lot, especially as Grace's character was the least prominent in Love, Lies & Lemon Pies in which she came off as a little stuck-up and unfriendly. However, in this book she has a chance to shine and her character really redeemed herself. So if you're interested in light-hearted, warm, [and tasty - yes I eat books..] novels, definitely try out Katy Cannon's debuts - and then go on from there! 1. Fold and iron your fabric in half lengthways, with the right sides together, and pin in place. 2. Sew along the long side of your rectangle, to give you one long tube of fabric. 3. Press open your seam, using an iron. 4. Turn the fabric the right way out and fold in half the other way, so the two open ends of your tube are together. Make sure the seams line up exactly. 5. Now to join both ends of the scarf. Take the two inner layers of fabric, pin them together then sew in place, removing the pins as you go. 6. Keep going around the circle until the two ends are joined. 7. If you’re using a sewing machine, leave a gap of about 5cm, fold under the edges of the unstitched section to match the rest, then hand sew the gap closed. Thank you to Stripes Publishing for sending me both of these books free of charge in exchange for honest reviews. Ooh these look so good! It's always nice indulging in a sweet, fluffy book once in a while - definitely picking this up. Great review! HAWWA HAWWA HAWWA HAWWA look who's back from her unplanned hiatus! She didn't have internet for a month (BT's to blame) but here she is once more! She isn't sure why she's talking in third person, but it's too late to stop now. She'd like to say - she may have said this before but if not she will now - that your blog is beautiful. In the world of amateur web designers and their obnoxious sidebars, angry fonts and awful header choices, it is amazing to come somewhere with such a nice design. She loves your background, header, minimalism, font choice etc. etc. She also loves the book cover colour schemes thing you've got going on. It's very snazzy. She's happy to be back in the blogosphere and as ever reading It Was Lovely Reading You. She's also going to change her url soon (she'll keep you updated). Since I received a bundle of swag for Love, Lies and Lemon Pies, I've been intrigued and wanting to read this book. It seems like a really quick, light-hearted read and I'm totally into those at the moment! Katy Cannon debut novel Love Lies and Lemon Pies and actrul got meat the author aqt my local bookshop, she is really nice.